Dad lived in North Road, Hull at the time and was one of the many boy scouts who during the bombing raids on the city were utilised as messenger boys between the ARP stations reporting incidents of bomb damage etc throughout the city. Dad (aged13) was cycling near Skidby on the day of the accident and was observing a Spitfire practising what transpired to be “dogfight practice “. The aircraft then went into a spin and crashed in fields near Risby Park not far from the road where dad was cycling along. I can only presume instinct just took over him and he then raced over to the stricken aircraft and attempted to rescue the pilot but unfortunately was beaten back by the flames . The cause of the crash is unknown but a possibility is pilot black- out caused by the G-forces created during the manoeuvres . The Spitfire had plummeted from 5000 feet and was flown by pilot sergeant John Patrick Walsh (service No 754138) who was aged 20. Pilot Walsh was born in Islington in 1919 to Harry(Henry) and Nellie Walsh (nee Wilcox), he attended Harrow County School for Boys from 1931, he was awarded school colours in athletics in 1935 & 1936 also being Kenton House junior athletics champion 1933, he also received school colours for Rugby in 1936. John left the school to join the staff of Harrow GPO. In 1939 John signed up to join the RAF as a volunteer reservist. His mother died in 1985 sadly his father died in 1929. John is buried in Harrow Cemetery,Middlesex with both of his parents. 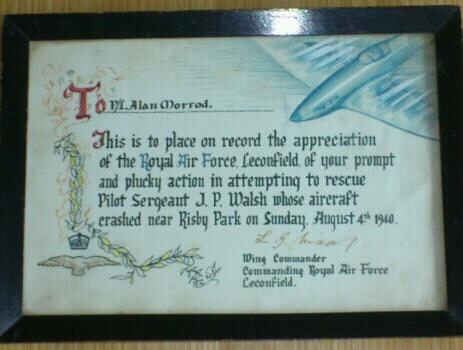 John was operating out of RAF Leconfield at the time of the accident.